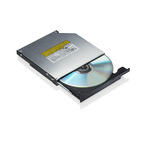 The 43N3212 - ThinkPad DVD-ROM Ultrabay Slim Drive (Serial ATA) is designed to easily install into the new native serial Ultrabay media bay found in selected ThinkPad systems such as the ThinkPad T400, T500, W500, R400, R500 Series notebooks and the ThinkPad X200 UltraBase. 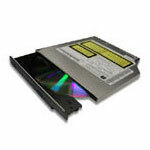 View DVD movies and install CD/DVD software with this optical drive option. The Lenovo USB 2.0 Super Multi-Burner Drive with LightScribe is a small form factor external portable DVD and CD recordable drive that can be attached to notebooks with a functional USB 2.0 port. The LightScribe technology enables you to create professional quality DVD and CD labels. Using the media labeling software contained in the Multimedia Center for Think Offerings software, you can easily design unique laser-etched labels with your own photos, artwork, and text. Now you can use just one drive for burning CDs and DVDs and then finishing off with professional quality labels. The ThinkCentre and Lenovo Serial ATA Super Multi-Burner Drive reads from and writes to dual layer DVD-R and double layer DVD+R media and features LightScribe technology, enabling you to create professional quality DVD and CD labels. Use the drive to archive and access data, video, photo and music files on high capacity DVDs or inexpensive CDs. NO External Power Required, draw power from USB or/and PS/2 port on your laptop. Burn CD-R/RW and DVD+/-R/RW discs and Play DVD/CD discs. Compatible with all laptops/notebooks that have at least one USB port and one PS/2 port, or two USB ports. Interface:Support USB2.0 (480Mb/sec), fully backward compatible with USB1.1 (12Mb/sec). Speed: 8x DVD+/- R/RW, 24x CD Wright, 10x CD Rewrite. Compatible with all laptops/notebooks that have at least one USB port and one PS/2 port, or two USB ports. NO External Power Required, draw power from USB or/and PS/2 port on your laptop. Interface:Support USB2.0 (480Mb/sec), fully backward compatible with USB1.1 (12Mb/sec). Play DVD/CD discs, Upgrade your laptop with 8x DVD/24x CD-Rom capability. Speed: 8x DVD read, 24x CD read. Speed: 8x DVD read, 24x CD read. Buslink's slim line external DVD burner is great for desktops with included vertical stand and its small size and weight ideal for notebook computers. It incorporates the dual format DVD burning. DVD+R burning speed are a fast 8x max. Recording speeds are 8x max for DVD+R and 8x max for DVD-R, 4x rewrite and 8x Read respectively. Ultra fast 24x max CD-R burning means you no longer need a separate CD Burner for good performance. Buffer under run is incorporated to assure quality recordings. DVD-ROM and CD-RW functionality for your desktop system. Get both in one space-saving, high-speed, multi-function drive. 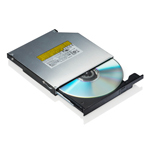 The CD-RW/DVD-ROM Combination Drive delivers the function of two drives for one low price. This Panasonic UJ880A writes to DVD+/-R media at 8x, burns to DVD+/-R DL at 6x and rewrites to DVD+RW discs at 4x! It also burns to CD-Rs at 24x and rewrites to CD-RW discs at 10x!Connect the Panasonic UJ880A into your notebook's DVD/CD IDE connector and burn, rip and store your own music CDs, photos, home movies, back-up your entire hard drive, and watch DVDs!